Mobile Couponing is more important now than ever and can encourage spending all while saving money for consumers. Mobile coupons are becoming a very popular and effective tool for retailers and provide unparalleled convenience for their customers. Integrating mobile coupons with a mobile marketing campaign can provide great incentives and generally yield much higher response rates. Mobile coupons can take the form of a unique code in an SMS message or a unique link to a digital coupon in the form of our Redemption App. The Redemption App (NOT actually an "app") is a digital coupon redemption system that will provide your customers with an engaging user experience when redeeming text offers and mobile coupons directly through their mobile device. This new redemption system can be used in tandem with the existing coupon redemption feature on the digital kiosk. The new "Redemption App" allows a business to send a text message offer with a traceable unique URL linked to a digital coupon. The customer then clicks on the URL and browses to a fully customizable digital coupon where they can get more details, redeem the coupon, and share with their friends! Viral sharing is a great way to increase your reach by leveraging your customers' vast social networks. Now we've added a NEW Mobile Coupon Referral Tracking system, making it easy for businesses to deliver special offers which can then be shared with others AND tracked as referrals. The referral tracking feature is a great way to incentivize and reward loyal customers who drive referral business. The new Mobile Coupon Redemption App makes it easy for your customers to redeem and verify coupons at the point of sale. The Redemption App system lets businesses effectively validate and track coupons and redemptions. Every account automatically includes a default Redemption App that is accessible in the Mobile Coupons section of the platform. Each of your mobile coupons is already configured to work with your default Redemption App. The Redemption App can be easily integrated into any text message that uses a mobile coupon. First, in the Campaign Composer, configure your message (Interactive Message OR Text Blast) to use a Mobile Coupon by selecting the applicable Mobile Coupon from the dropdown in the Advanced Message Options. Next, instead of using a ~coupon~ in your message to generate and display a unique mobile coupon code, include ~redeem~ to generate a unique link to the redemption app for the specific mobile number. The ~redeem~ will be replaced with a unique URL (e.g. http://rdm.mobi/XXXXX) for each mobile number to allow for reporting. When a customer clicks on the unique URL they received via text, their mobile browser will launch the Redemption App. From here they can read the details of their mobile coupon and then click REDEEM when they are ready. This will prompt the customer to confirm their intent to redeem and will then display a countdown until the coupon expires. Once the coupon has been redeemed, the customer will show their phone onsite for confirmation. 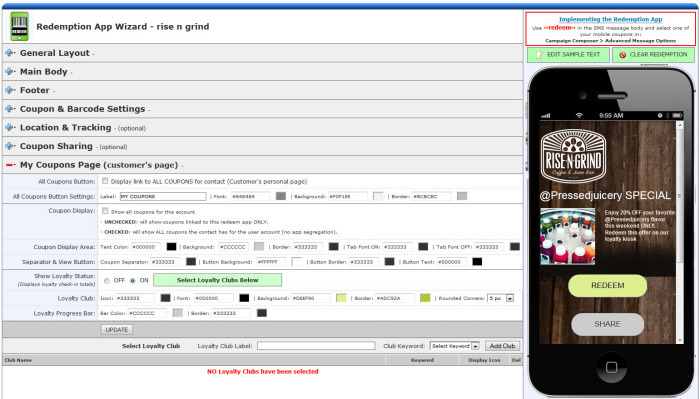 The redemption app can also display an optional barcode which can be scanned at a POS. Share stats show a contact how many coupons have been shared, viewed, issued, and redeemed. Contact can share the coupon via their mobile device, Facebook, and Twitter. Contact can click on MY COUPONS to go back to the coupons that they've previously been issued. Customize the look and feel of the share page in the Coupon Sharing section of the Redemption App Wizard.